This book, Energy and Environment in Architecture, has been produced by Nick Baker and Koen Steeemers at The Martin Centre for Architecture and Urban Studies. 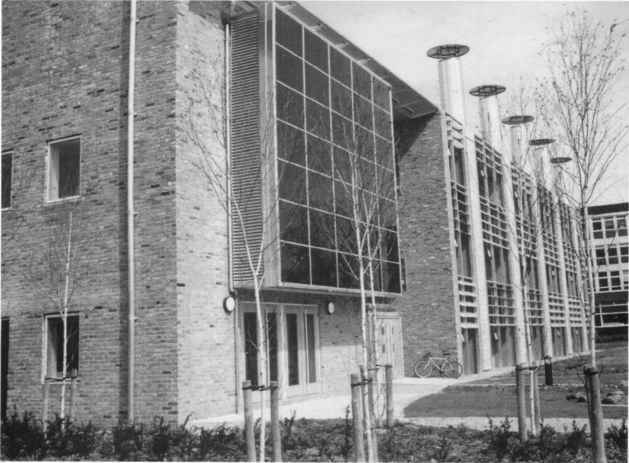 The Martin Centre was founded by Professor Sir Leslie Martin in Cambridge in the 1960s. Early in its history the Centre became interested in how buildings use energy (in particular the relationship between energy and architectural form), developing analytical tools and computer models for analysing a wide range of factors to predict the performance of a building. The Martin Centre has never jumped on the "glass is a wonderful material" bandwagon, but Nick Baker and Koen Steemers have now collected together their experiences to produce this book. Part One provides a mostly non-quantitative explanation of the factors in physics which describe the performance of a building. This will give architects an understanding of the principles involved and it will give engineers an insight into the kind of information which is needed to enter the architectural debate and have some influence on the form of a building. The advice should not be taken as prescriptive. The LT Method, which is covered in Part Two of the book, may seem to be prescriptive, but when I first read it as part of the brief for an ideas competition for a building in Europe, it represented a breakthrough. The idea of the passive and nonpassive zones of a building is coupled with calculations where the amount of total energy use has a minimum value when the light admitted by windows offsets the extra heat loss of those windows. I was able to explain the ideas to my co-worker architect. We then developed the ideas outside the prescribed calculations of the LT Method, but modified the calculations to show exceptionally low energy use, and won the competition. Not only that, but for me (and I hope now for everybody else), the LT Method provides a means of designing buildings with reduced energy consumption. 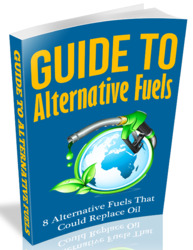 Read the book and then extend its thinking so that we can design buildings which need no electricity for lighting if the sun is above the horizon, need no fossil fuels for heating and no fossil fuels for cooling. 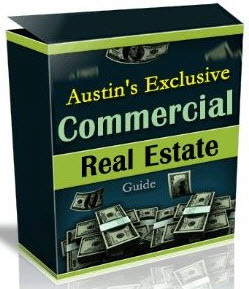 1.1 Annual energy costs in 92 individual office buildings. Source: BRECSU(1). 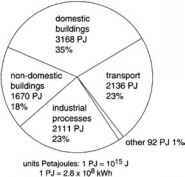 The energy consumption of non-domestic buildings varies over a wide range, even for buildings of similar-use types as illustrated in Figure 1.1. A well-designed daylit and naturally ventilated office building such as the BRE Low Energy Office (building no. 92 on tlgraph^. with efficient and well-controlled plant, will have an annual energy cost less than £3.0/m2yr. On the other hand, an air-conditioned, deep-plan, overglazed building, with poor services design and control, could cost more than £45.00/m2yr. This suggests that for many designs there is the need for significant improvement. But just what are the parameters which lead to this wide variation in performance, and to what extent are they in the control of the building designer? And furthermore, can these parameters be optimised for energy performance without compromising the comfort and well-being of the occupants? Nearly half of the UK's energy use is accounted for in buildings, and of this about a third is used in non-domestic buildings (Figure 1.2). The growing awareness of the environmental effects of energy use, and the commitment to respond by reducing energy consumption and the associated CO2 emissions, places conservation in non-domestic buildings high on the agenda. Equally topical is the concern for the health and well-being of the occupants of these buildings, in which many spend almost as great a part of their lives as in their homes. 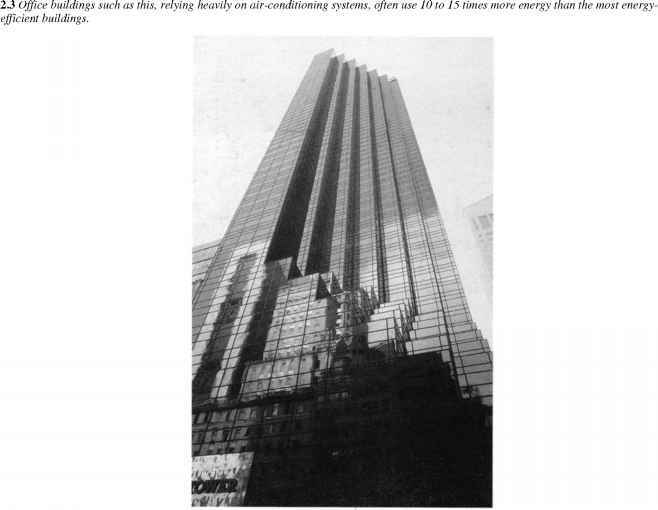 The purpose of this book is to reconcile these two aims—the design of low-energy buildings without reducing the internal environmental quality. 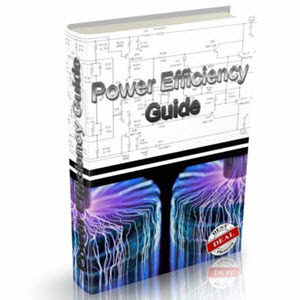 It provides the principles upon which recommendations for low-energy design are based, and by using the LT Method, described in Part Two, a way of testing the initial design proposals. Whilst primarily addressing the design of new buildings, many of the principles can be applied when refurbishing and remodelling existing buildings. 1.2 Energy by end use in the Source: Digest of UK energy statistics 1991. 2.1 Building, system and occupant factors affecting energy consumption in non-domestic buildings. We have already referred to the wide range of energy consumption in buildings of similar-use type. It is important to point out that the energy consumption is by no means an indicator of the degree of comfort in buildings—indeed complaints relating to comfort are more prevalent in air-conditioned buildings which generally consume more energy than non-air-conditioned ones. Thus we have the situation where buildings which apparently achieve the same end result are consuming energy over a tenfold range. We would be somewhat surprised to find two family saloon cars returning fuel consumption figures differing as widely as 6m.p.g and 60m.p.g.! We might reasonably conclude that if the first car could get the family from A to B for ten times less than the second, then the design of the second car is seriously suspect, showing an almost immoral disregard for the environment. Why then do we tolerate this situation in buildings? A fourth factor could be the presence of a particular activity or process in the building, such as the use of a large computer in an office building, a heavy use of energy for a swimming pool in an institutional building, or the process energy in a factory. When assessing a building's performance it is essential to be aware of these cases, and account for them separately from the energy for environmental conditioning. The next question is—what is the relative contribution of these factors to the tenfold range in performance? From studies using the LT Method it has been found that allowing building design parameters such as plan, section, orientation and façade design to vary over a plausible range, energy use varies by about 2.5 times. If we allow the services system parameters, such as lighting efficacy, boiler efficiency, etc., to vary, this range is extended to about 5 times. 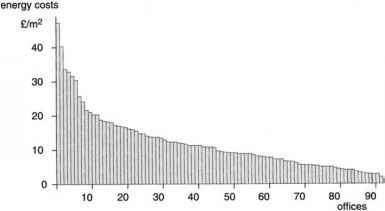 Thus we can conclude that occupant factors account for the remaining twofold variation bringing the total to 10 as observed in the real data in Figure 1.1. It must be stressed, however, that these are not precise figures and contain many assumptions. To explain this concept further, let us consider a worst case compared with a best case. A building of poor design creates a demand 2.5 times greater than one of the best design. If the bad building is equipped with services of bad design the mechanical systems will consume 2.0 times as much as the same building with good services design. If the occupants of this badly designed, badly serviced building manage the building in a wasteful way, this will create a further factor of two compared with optimum building management. The commuting of the factors leads to the worst case consuming 10 times more than the best case (Figures 2.2 and 2.3). At first sight, however, this analysis might seem rather disappointing in respect of building design guidance—why should the architect take on new constraints if the major contribution to energy performance is jointly held by the engineer and the occupants? 2.2 The original Low Energy Office at the BRE, built in 1983 and refurbished in 1991, now returns an energy cost of approximately £3.00 per annum, the lowest in the examples shown in Figure 1.1. It is a shallow-plan heavyweight building, naturally ventilated, and daylit. factors that are the least likely to be changed. Only major refurbishment could do this, whereas services systems can be improved and may be replaced as a matter of course relatively frequently. And better management can persuade occupants to use the building more efficiently. Secondly there is growing evidence that the three factors (building, services and occupants) do not operate independently that certain low-energy strategies for building design are more likely to result in better system performance and more favourable occupant behaviour. For example, buildings with carefully controlled solar gains, moderate fabric losses and good thermal inertia require much less intervention from services systems and there is thus less opportunity for them to operate inefficiently. Furthermore, in simple shallow plan buildings, where most occupants sit close to openable windows, it is found that the occupants are much more tolerant of temperature swings and environmental conditions in general, making much less demand on the mechanical systems. Thus it seems that strategic decisions for design have a knock-on effect and therefore much wider implications for the actual performance of a building over its lifetime than the initial energy analysis might suggest. There is also growing evidence that buildings which gain their good energy performance by adopting passive design solutions, such as daylighting and natural ventilation, also show higher occupant satisfaction. This suggests that the initial strategic moves by the designer are very important, and that it may be more appropriate to use simplified energy tools to predict performance early in design development than to use detailed simulation studies later. The following baseline design advice could be applied at the beginning of the design development, and for most non-domestic buildings will ensure a robust solution which will probably attain 75% of the performance of a carefully optimised design. It will go some way to meet the aims of energy conservation, global environmental protection, and internal environmental quality (Figure 2.4). The purpose of the remaining material in this technical guide is to explain these strategies more fully and use them to give quantitative design guidance. Avoid the need for air-conditioning by employing shallow plans. This permits natural ventilation and daylighting, but unwanted solar gains must be avoided in summer by shading and correct orientation. The use of passive solar gains, particularly for ventilation pre-heat, can make modest reductions on heating load. Natural ventilation eliminates fan power; night ventilation (naturally driven or mechanical) can reduce daytime temperatures, typically by 3°C. Controls should be easy to use and compatible with the occupant needs. Ideally controls should incorporate a 'caretaker' function, returning a building to a low-energy mode after occupant intervention. Condensing boilers, heat recovery and heat pumps can make savings in heating demand. Low-energy light sources reduce electricity demand. Combined heat and power (CHP) is a highly efficient option for larger buildings. If mechanical cooling is unavoidable, minimise load by adopting passive means (e.g shading) or operate in mixed mode. 2.4 The new BRE Low Energy Office incorporates many of the same characteristics of the earlier BRE building, but in a far more sophisticated form.